This Pacemaker Transportable "58" model NA3201-112 was manufactured in New Zealand by Collier & Beale in 1958. 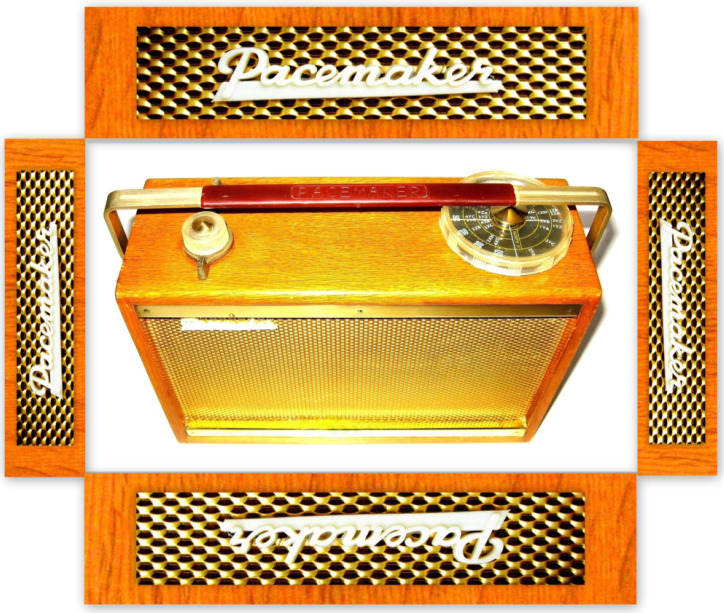 It is the successor to the first New Zealand designed and manufactured transistor radio, the Pacemaker Trans-portable released in 1957. The original Trans-portable used 8 RCA transistors and it was claimed to be the only set in the world at that time to use an RF stage. This Pacemaker Transportable "58" is similar in appearance to the early Sony TR-72 released in 1955. This is interesting because in the mid to late 1950's Collier & Beale formed a relationship with the Sony Corporation, enabling them to manufacture certain models in New Zealand under license. These radios were branded as ‘Sony Pacemaker’ and production continued until 1966. See Sony Pacemaker TR-610. 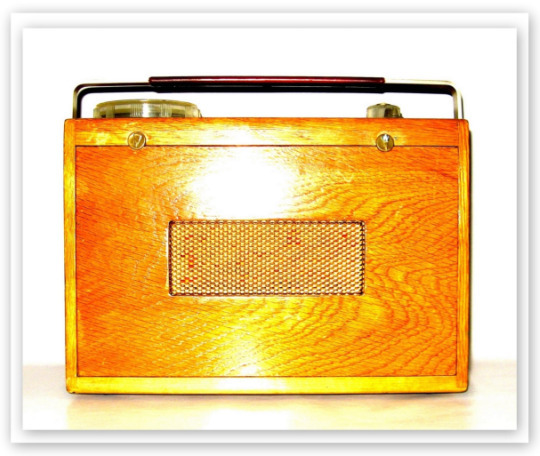 This robustly constructed radio has a solid oak cabinet and metal chassis. It also features a rugged, gold metal speaker grill, solid brass fittings and a swing carry handle. A smaller rectangular portion of the metal speaker grill is found on the back of the radio and acts as a vent. ‘T R A N S I S T O R I S E D - 5 8’ is written across the brass strip on the bottom half of the radio. The tuning dial is marked 'South Island' & 'North Island' with corresponding station call signs. This Transportable "58" is more conservative looking than the Sony TR-72 but given the obvious likeness and the close relationship between the two companies could Sony have had some input into the design and look of this ‘Transportable 58’?, possibly, or perhaps they just turned a blind eye, for whatever reason. 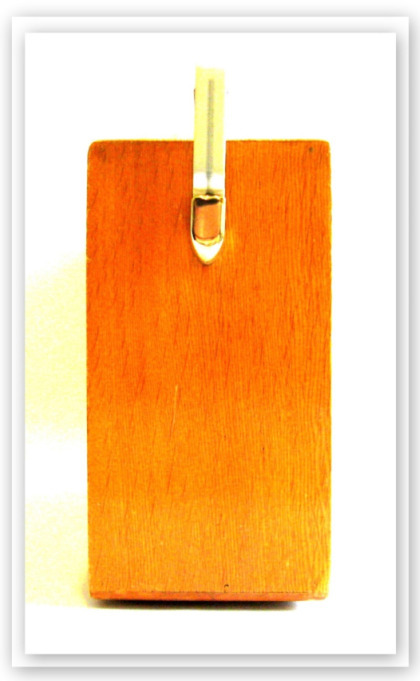 It measures 11" L x 7.5" H x 3.8" W and can be found in dark oak or light oak cabinets. 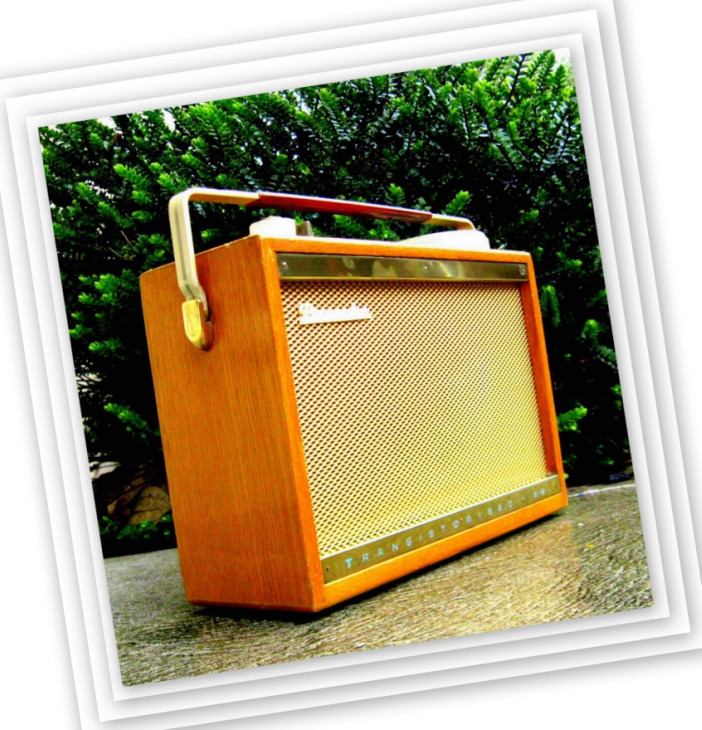 Collier & Beale released five versions of the original Trans-portable between the years 1957 & 1964 with later models, such as this Transportable "58" using 7 transistors. Collier & Beale was formed in Wellington, New Zealand in 1926. In 1939 they introduced the first of a line of radios branded as ‘Pacemaker’. In 1954 the General Electric Co of England (GEC) acquired a majority shareholding in the company. By 1973 Collier & Beale had ceased to exist as they were taken over by GEC (NZ) Ltd.
Ref: The Golden Age of Radio in the Home by John W Stokes. 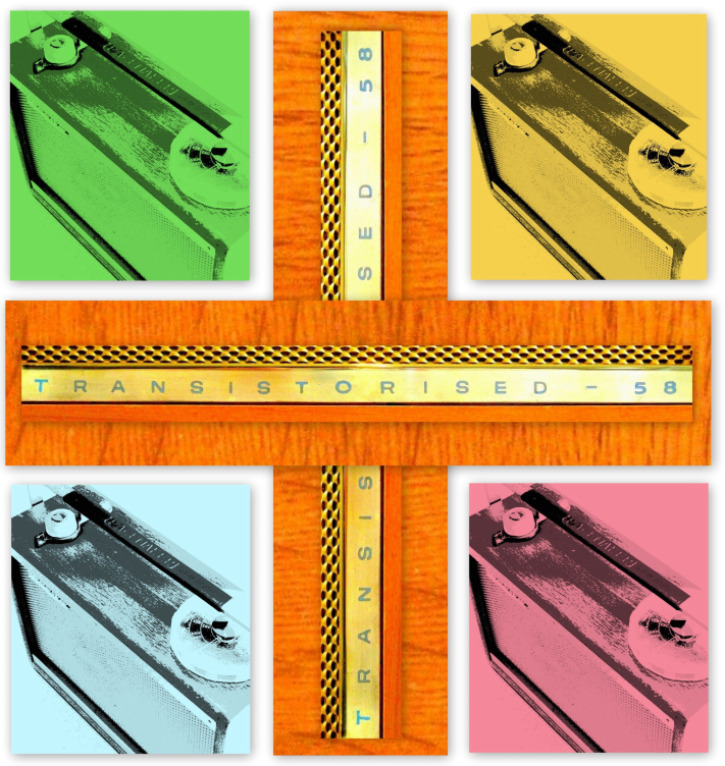 As discussed earlier, Collier & Beale released five versions of the original Trans-portable. The first model, No1, was released in 1957, the No2 model in 1958, the No3 model in 1960, the No4 model in 1963 and the No5 model in 1964. Fellow collector Keith Annabell emailed me the following information outlining the differences in design between the first three models. This is very helpful when it comes to identifying which set you may have. Thanks Keith! The manufacturers labels found inside and the script located on the front brass strip are different on each model. The capitalised words are shown exactly as they are written. No1. TRANS-PORTABLE inside, TRANSISTOR 8 on the front. No2. TRANSPORTABLE "58" inside, TRANSISTORISED-58 on the front. No3. "TRANSPORTABLE" inside, TRANSPORTABLE on the front. No1. Has a plate behind the Pacemaker name badge on the front. No2. No plate behind the Pacemaker name badge. No3. No plate behind the Pacemaker name badge. No1. The back is bottom-hinged. No2. The back slots in and is not bottom-hinged. No3. The back slots in and is not bottom-hinged. No1. Rola speaker has size (4 x 6 F) printed on it. No2. Rola speaker has 'F' written on it. No3. Rola speaker has 'F' written on it. No1. Three screws securing the chassis. No2. Three screws securing the chassis. No3. Four screws securing the chassis. To remove the chassis on the No1 & No2 models undo the two screws holding it onto the handle brackets, and the screw at the bottom, beside the right transformer. The volume and tone knob pulls off, although it might be tight. To remove the tuning dial, first undo the central brass screw then carefully pull the two plastic pieces that make up the dial off. Then lift the whole chassis with attached speaker out the back. 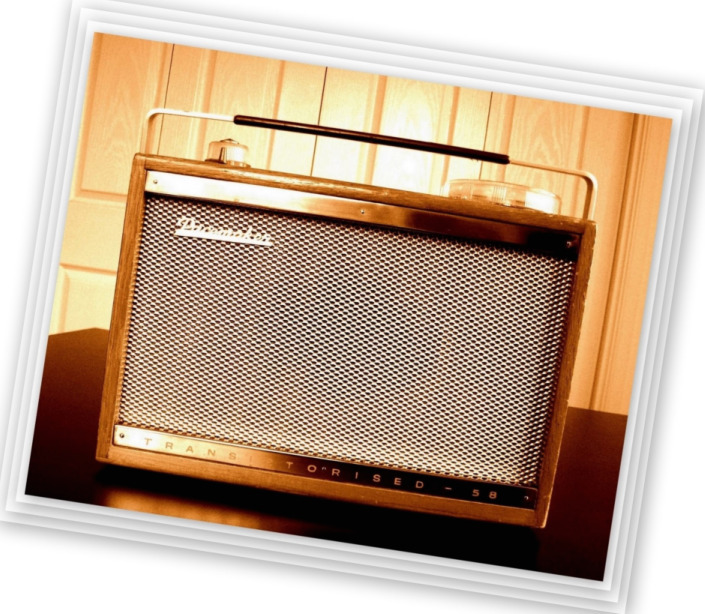 This Transportable "58" uses seven RCA transistors and a Rola speaker. This model was distributed in New Zealand by H.W. Clarke (NZ) Ltd.